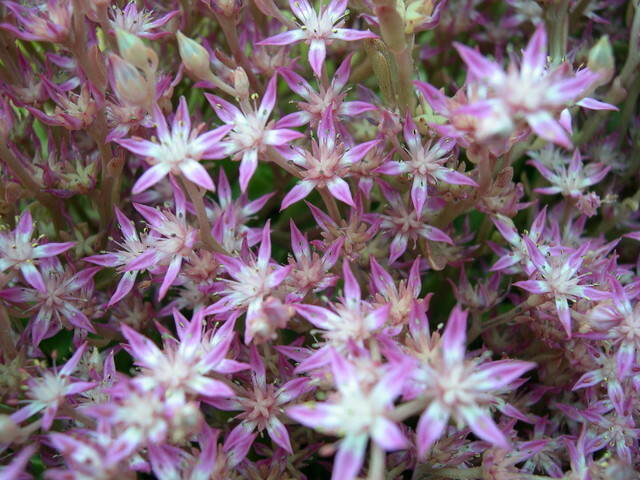 This species has a growth pattern that makes it stand out as very unusual in the Sedum world. In the fall it has rosettes of large flat leaves right at soil level. In the spring the stems get longer until the middle of summer when it blooms. Star-shaped flowers have rose-purple petals with a white blotch visible at the base. After blooming, they go totally dormant but come full circle in the fall with rosettes of flat leaves at soil level.